StarCraft II has begun its long journey to match its legendary predecessor by selling three million copies in its first month on shelves. Since its 1998 launch, the venerable StarCraft has sold about twelve million copies. Today, Blizzard announced that in its first month on shelves, StarCraft II was already a quarter of the way toward that goal. Since July 27th, announced Blizzard, StarCraft II has sold 3 million copies around the world, making it the best-selling PC game of 2010 thus far, and the fastest-selling RTS title of all time. 1.5 million of those copies were sold in the first 48 hours, letting the title breeze to an easy three mill over the next few weeks. Not quite the seven million copies predicted by year's end, but certainly laudable, and the game has already outsold the original in the UK. It's an even more impressive number given that the game is 100 percent exclusive to Windows and Apple PCs. 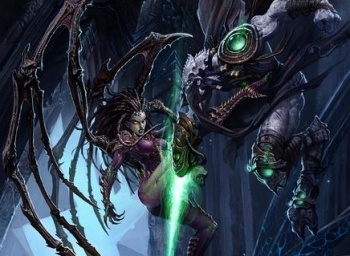 "We appreciate all the enthusiasm that players around the world have shown for StarCraft II," said Mike Morhaime, CEO and co-founder of Blizzard Entertainment in a statement. "It was important to us to deliver an overall gameplay experience that was accessible, balanced, and fun, and it's been gratifying to see how strongly the global community has already embraced the game." These numbers are well-deserved, because the game is superb. Blizzard has already announced a 1.1 patch for the game that makes balance changes and adds playability functions for left-handed players, and at least one of the features fans have been clamoring for - chat channels - will soon be on its way as well.